When you live on an island that straddles the Roaring Forties, you know that spring weather is going to be “interesting”. There are complex meteorological reasons for this, but let’s simplify. When the huge land mass to our north is warming far faster than the vast oceans that totally surround us, that differential is going to mean volatile weather. At the whim of those two geographical bullies, our spring isobars tighten, as though tensing themselves for a pounding from the wind, snow, rain and sun. And so it proved again for this year’s Show Day weekend. 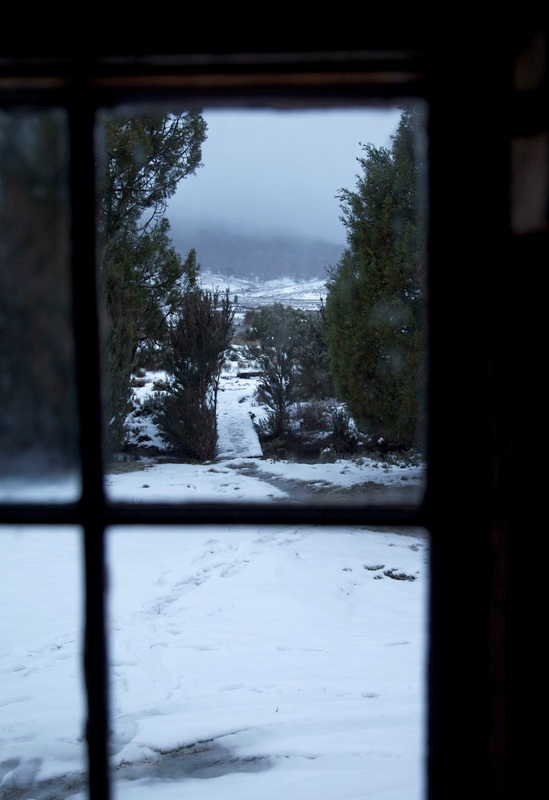 With cold fronts and cloud bands lining up for their turn, we wisely included a hut in our “boys’” Cradle Mountain bushwalking plans. It’s not that we object to a bit of whooshing weather; we know it helps make the place what it is. It’s more that we enjoy retreating to a hut after we’ve braved those elements: somewhere to warm up, dry off, sag down, have a few drinks. The perfect setting to remind ourselves how courageous and adventurous we’ve been going into the mountains in such conditions! That was the theory at least, and it fed our email banter in the days before the trip. As we drove into Cradle Valley it was snowing and blowing, and the short walk to the hut was through six inch deep snow. But we dismissed the scene as merely “atmospheric”, especially when the wood heater was cranked up, and the first wine and cheese were liberated. Ah but there’s always cabin fever. Reading, eating, snoozing, talking are all very well, but they need to be broken up by a little physical activity. And somehow the “12 Minute Indoor Physical Fitness” program that Tim O had thoughtfully printed out for us was never going to be a total success. No … come Saturday we were well and truly ready for some actual bushwalking. When the weather was looking vaguely less threatening, Tim D suggested a 2 to 2 1/2 hour walk via some seldom-walked tracks and routes that he knew. With naïve trust in our friend, and a “what-could-possibly-go-wrong?” attitude, we kitted up and headed off. The plan was to climb up to Cradle Plateau gradually – a kind of long sneak attack by way of Riggs Pass – before looping back towards the hut via the Horse Track. We’d be back for lunch. Two hours later the fun really began – and we weren’t even on the plateau yet. We’d left a well-marked but unmaintained track and joined an occasionally-marked but overgrown route. As we climbed higher, tripping and slipping through ankle-tapping scrub, the weather wavered a little. Was it going to offer us some views or would the rain and snow grow worse? Frankly we expected both. 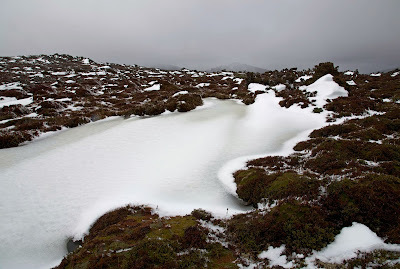 We weren’t disappointed, although it wasn’t until we reached the highest parts that the snow and wind really kicked in. 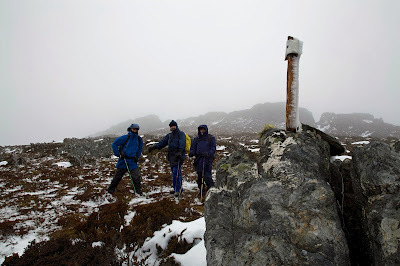 Horizontal snow and sleet lashed us, biting into the exposed parts of our faces, relenting only when we found rock outcrops to shelter behind. Yet any stop quickly chilled us, regardless of the quality of our wet/cold weather gear. 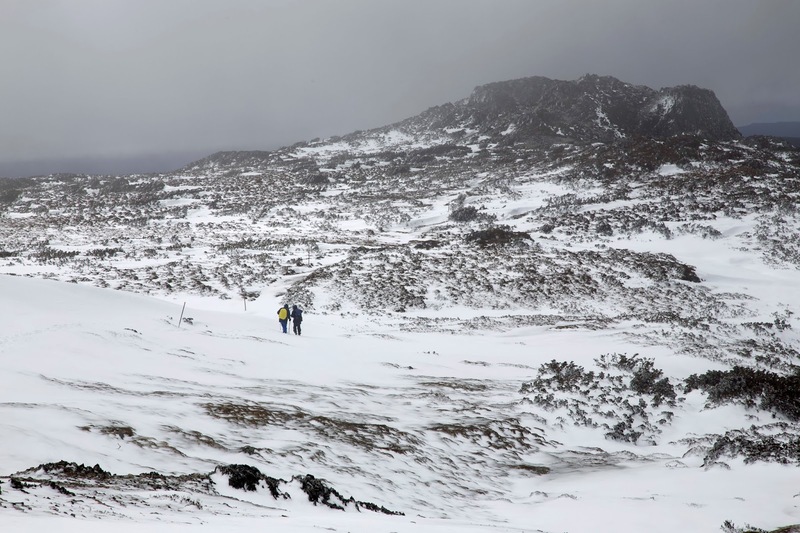 We walked on, despite the Antarctic conditions, finally cresting the plateau. Visibility was poor, route markers very sparse. Tim D tried to look confident – and occasionally failed – as he searched for the cryptic route. It should be intersecting with the Horse Track, a well-marked alternative section of the highway-like Overland Track, somewhere up ahead. Nearly four hours after starting our walk, we at last spotted the markers of the Horse Track. A couple of us whooped; Tim D looked relieved. A surprisingly high cornice of snow separated us from the track, so in a close simulation of youthful exuberance, we body-tobogganed our way down to the track. An hour later we were back in our warm hut and pouring some wine. But then, as if to make us question what the fuss and fear had been about, two things happened simultaneously. The sun shone, and a wedding party turned up at our hut for a photo shoot. All dressed in the usual gear, they had made only one concession to the conditions. 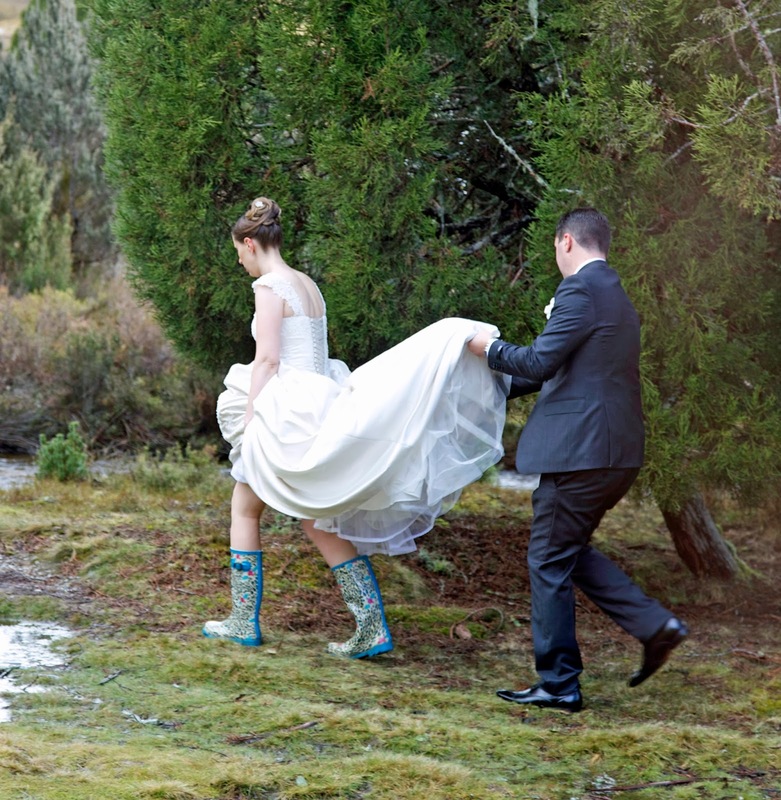 The bride wore floral gumboots. Ah spring!